Coming from out under their umbrellas long enough to participate in a ribbon-cutting ceremony, officials from Orange Township’s Park Department, the U.S. Army Corps of Engineers, and the Ohio Department of Natural Resources officially opened the new bike/pedestrian bridge that spans the spillway of the Alum Creek Dam. 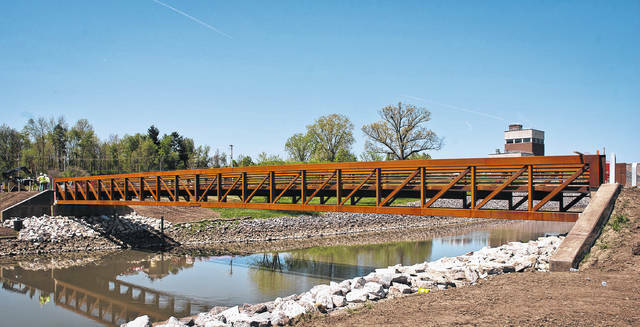 The bridge now offers a safer connection from the trails of Alum Creek to the Orange Township Trail System. The new bike/pedestrian bridge that crosses over the Alum Creek Dam spillway opened Friday. 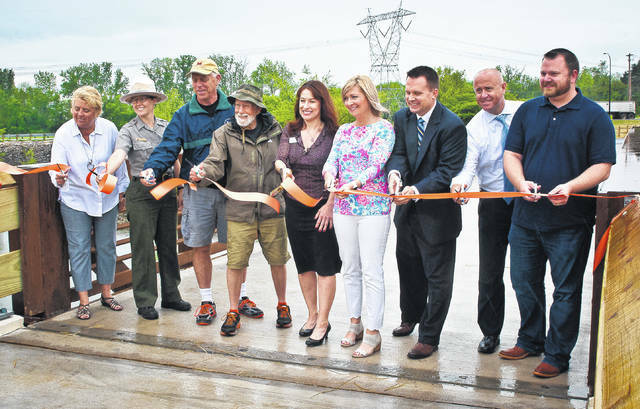 In the rain on Friday, the Alum Creek Bridge Trail at Alum Creek Below Dam Area, 5905 Lewis Center Road, was officially opened during a ribbon-cutting ceremony featuring officials from federal, state and local government agencies. The new bike/pedestrian bridge spans the spillway of the dam, connecting the trails of Alum Creek to the Orange Township Trail System. Overturf is the owner of RPO LLC, an independent contractor hired by the township to help write grants and represent the township in overseeing projects from design to completion. Overturf said the parks department first looked into doing something with the traffic bridge just before the park entrance on Lewis Center Road but didn’t see it as a safe option for pedestrians. Construction of the bridge was a joint venture that included the Orange Township Park Department, the U.S. Army Corps of Engineers and the Ohio Department of Natural Resources. Sylvia Chelf, U.S. Army Corps of Engineers resource manager, said the planning for the bridge really started to come together in 2013. “It’s when everybody sat down at the table and talked about it,” she said. Chelf said the Army Corps, who owns the land, provided the township with a lease for the property the bridge is built on and some funding for its construction. Chelf said she was glad to see the project come to fruition. “It’s been a great project. I know the public is excited,” she said. Barrett Ault, Orange Township Parks Board chairperson, said the bridge made a trip from Alabama in two separate pieces, then on a rainy November day, she and others watched the bridge lowered into place. Ault said it has been wonderful working with the Army Corps, and she looks forward to future projects with them. Brooks Vogel, a partner with Korda/Nemeth Engineering, said his company designed the bridge, and he was design manager on the project. He said his job was to make sure everything fit together, that the spacing was correct, and everything was according to spec. Vogel said his company is now working on a trail to take Bale Kenyon up Lewis Center Road. “We just keep connecting everything and moving things forward,” he said. Beth Hugh, parks and maintenance director for Orange Township, said the bridge is part of the township’s 2008 Master Parks Plan. She said the township applied for and was awarded in 2015 two grants totaling $450,000 from the Ohio Department of Natural Resources for the bridge trail and Bale Kenyon Trail. She said that Alum Creek State Park gave the township $22,000 for the project from the sale of an easement to Consolidated Electric. Hugh added the concrete would have cracked and crumbled during transport to the spillway from Alabama, so it was poured once the bridge was in place. However, she said they had to wait until spring when the weather was warm enough to pour concrete. Overturf said concrete had to be poured in a steady 45-degree weather, which didn’t happen until April. Hugh said the bridge is 12 feet wide, so people can fish off of it and there is still plenty of room for others to pass by. She added the connecting of the trails should bring more people to Alum Creek and the surrounding area. The next project the township will address is the second phase of the Lewis Center Trail, which is currently in the drawing stages. This entry was tagged Ault, Chelf, D. Anthony Botkin, Ohio Department of Natural Resources, Orange Township’s Park Department, U.S. Army Corps of Engineers, Vogel. Bookmark the permalink.